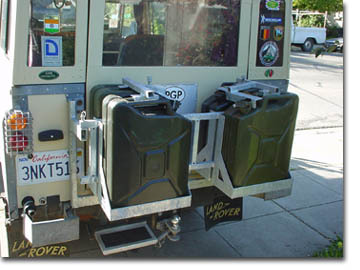 Fuel Capacity: Three on-board fuel tanks provide a combined switch able capacity of 54 gallons (204 liters). We have mounted a mechanical three-way NAPA valve conveniently on the seat box to switch the tank draw. There's also a Purelator electronic fuel pump positioned in line, just before the mechanical fuel pump. It can be switched on to prime the pump when we run out of gas. Finally, a dashboard switch toggles the fuel sender for the fuel gauge. friend Geoff Tobin of Expedition Engineering and built by Ron Ogomori of Fabricor in Burbank, CA. 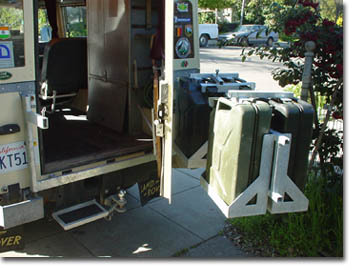 Each Dormobile is equipped with a swing away carrier.